ExpertGPS Pro can convert between lat/long, UTM, and any of these state plane coordinate systems used in North Carolina. Need to send North Carolina state plane coordinates to your GPS? ExpertGPS will transfer North Carolina eastings and northings to any Garmin, Magellan, Lowrance, or Eagle GPS receiver. You can import, convert, and reproject GIS shapefiles from ArcMap, DXF CAD files from IntelliCAD and AutoCAD, or bring in X,Y data from any spreadsheet or CSV file. 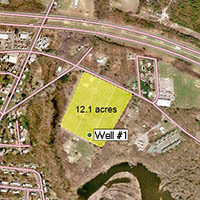 ExpertGPS maps all of your North Carolina state plane points and polylines over North Carolina topo maps, aerial photos, and your own scanned maps or site plans. Click on any of the links below to get step-by-step help in how to convert North Carolina state plane coordinates to lat/lon, UTM, or any other coordinate format, datum, or file format using ExpertGPS Pro. Click on one of the links below for step-by-step tutorials on converting between North Carolina northings and eastings and lat/long or UTM coordinates. 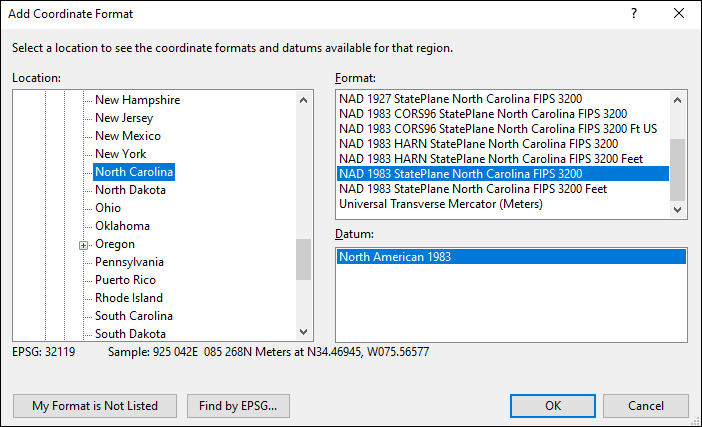 ExpertGPS Pro can convert between any of the North Carolina coordinate formats shown in the Add Coordinate Format dialog below. For complete details and step-by-step instructions on solving the most popular data format and North Carolina coordinate conversion problems, click on one of the North Carolina State Plane links above.